Many entrepreneurial business leaders have never started a company. So how can we consider them to be entrepreneurs if they’ve never launched their own business? In reality, entrepreneurship is a dynamic mindset. Those who possess it are bold enough to spot opportunities, seek out growth markets and overcome risk. To me, the following qualities – and leaders — epitomize an entrepreneur. They’re fearless. HSNi’s Mindy Grossman wasn’t afraid of a volatile economy when she took the company public during what became one of the deepest recessions in history. “Entrepreneurs not only start companies from the ground up, they also transform businesses and create new opportunities,” Mindy says. They’re passionate about what they do. Take Denise Morrison, the 12th CEO of Campbell Soup Company and the first woman awarded that position. She cultivates cross-functional teams who are bringing innovative new products to market and engaging with younger consumers, resulting in the reengineering of an iconic American brand. She believes in unleashing her employees’ potential to take calculated risks, fail, learn and reapply the lessons learned. “If you do that, and you maintain an unrelenting focus on the consumer, profits will follow,” she says. They face uncertainty head on. Avinoam Nowogrodski’s software start-up, Clarizen, almost went under in 2008. Instead of succumbing to pressure, he leveraged it to turn his business around. Now, the cloud-based project management company is expanding. “Don’t just ask yourself what you can do, ask what you can stop doing,” he says. They’re not afraid of risk. Joseph Bryant’s experience is a prime example of an entrepreneur who’s willing to embrace risk. The founder of Cobalt International Energy, convinced investors he could make the high stakes oil exploration company a success. He knows firsthand that an agile company, armed with the best available information and a disciplined business model, can compete with the world’s largest companies. They’re opportunistic. Lyndon Rive operates in the volatile solar energy sector, but he’s capitalized on the opportunities. His company, SolarCity, competes against the major utilities but is thriving because of, rather than despite, its unconventional business model – buying rather than manufacturing solar panels. They know that learning is a lifelong journey. The entrepreneurs I most admire are lifelong learners who seek out the wisdom of others. The advice they receive guides their decision-making and determines the values they infuse in their companies. Many of them still cherish the wisdom of their parents and have used their advice to reach new heights in business. 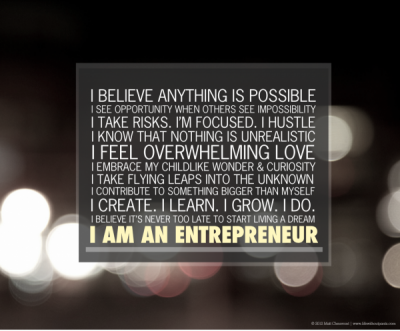 What comes to mind when you think of entrepreneurship? I’d love to hear some of your ideas.